Reece Pocock was born in Adelaide, South Australia, where he now lives with his wife, Marilyn. His son Stuart and his wife Karen, with their three gorgeous daughters, live nearby. Reece loved to read Zane Grey westerns and Mickey Spillane's crime stories. Previous to reading novels, Reece and his friends loved comic books. Reece wanted to travel, and joined the army. His military service occurred all in Australia. He served at Kapooka in NSW, Puckapunyal in Vic, and Ingleburn in NSW where he served in the elite Field Force. This group had to be prepared for deployment to trouble spots at short notice. Nevertheless, at this time, this battle ready force was not required. He did however, travel to North Queensland for an extensive exercise. He jokingly comments, he never saw conflict except in the various bars he sometimes visited. However, an explosive killed a soldier on an exercise in which he participated. It gave him a personal experience of the ephemeral nature of life. On his discharge, Reece returned to the blinds and awnings industry. He worked in the factory for a few years before he became the foreman. He later entered sales with some degree of success and became a supervisor. Reece married Marilyn, and later had two children, Kylie, and Stuart. Being politically aware, and not satisfied with the local council's performance, Reece ran for election and became a councillor on the Campbelltown Council. He was later elected as an alderman and became the town planning committee chairman. He was chairman of the committee that established the Campbelltown Library, and a delegate to the River Torrens committee that initiated the River Torrens linear Park. Reece was a good sportsman. He played Australian Rules football, cricket, and tennis. These days Reece watches his granddaughters play tennis. Reece is a Returned Soldiers League member. He was awarded the Australian Defence Medal for his military service. He studied from 2000 to 2003 to obtain his Advanced Diploma of Arts (Professional Writing). This experience had a profound influence on his life, and opened up many opportunities and proved life changing. Reece likes to read and enjoys good writers such as — Tim Winton, Colleen McCullough, Jeffrey archer, Eric Maria Remague, Ernest Hemingway, Robert Ludlam, Dan Brown, Ian McEwan, Lee Child, Josephine Tey, George Elliot. Crime writers Reece enjoys are—Elizabeth George, Val Mcdermid, Ruth Rendell, Linda LaPlant, Reginald Hill, Patricia Cornwell, Alex Kava, Ian Rankin, and Raymond Chandler to name a few. He is a SA Writers' Centre member since 1988, as well as Crime Writers SA, and the Australian Writer's Guild. Reece regularly critiques other writers work and lectures on editing. Reece has had a varied and interesting life to date. The highlights are his marriage, his children, and his grand children. The joys of family life have offset the disappointments and the constant struggle. Reece speaking at the Tea Tree Gully Book Launch. Mark Gamtcheff, second, Fiona MacIntosh, and Reece Pocock after Reece won the Burnside Library short Story Contest with his story 'The Girl in the Red Beret'. Fiona presented the prizes. 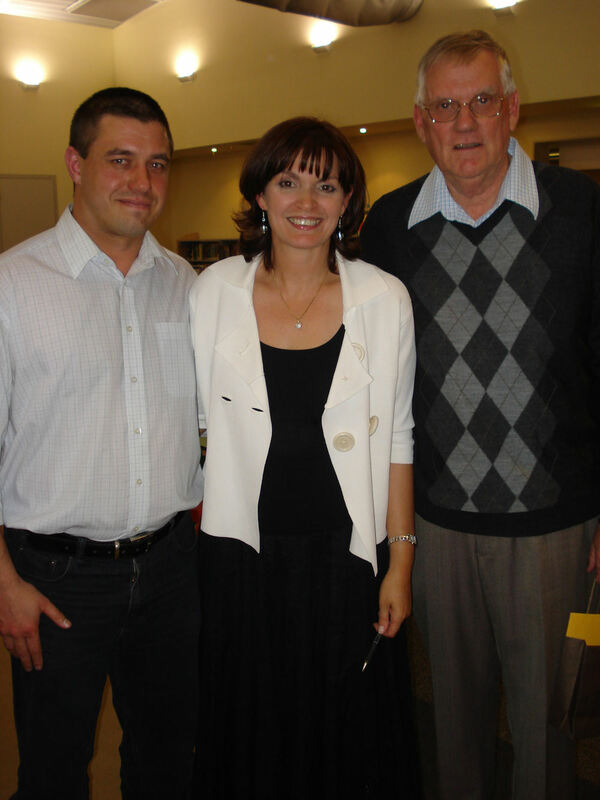 Reece signing 'Murder on Display' for a buyer, at the Tea Tree Gully Library book launch.